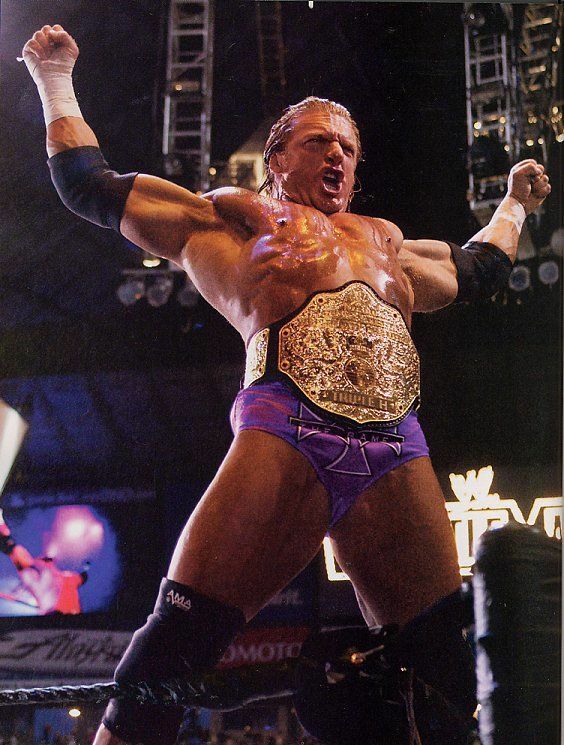 Stun-locked's inspiration for his outfit. Imazi pointed me over to this thread, and it is too good to not use! 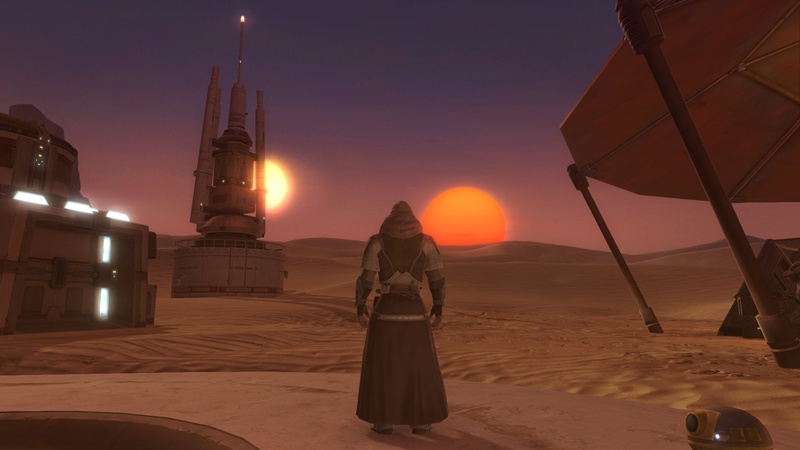 Standard Jedi outfit, getting that Jedi sillhouette and desert-dweller aesthetic. 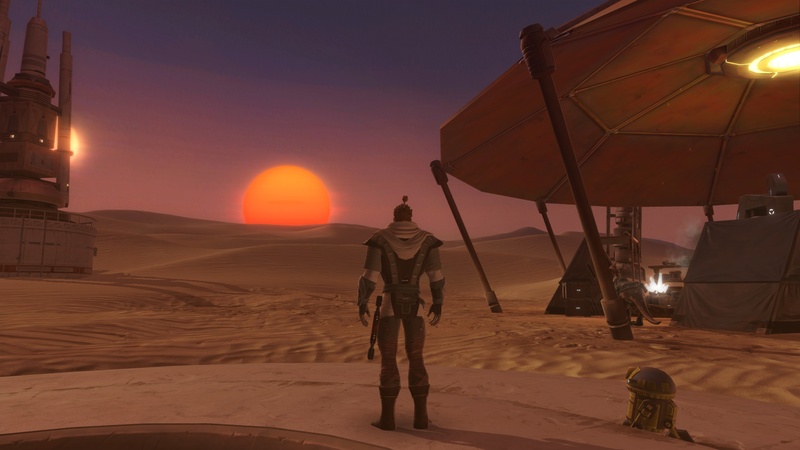 I noticed that most if not all of the Iridonian Zabrak we've seen in canon sources (for example, Eeth Koth, Agen Kolar, Sugi, etc.) wear turtlenecks or at least something that covers the neck, so I've headcanoned it as being an Iridonian thing. 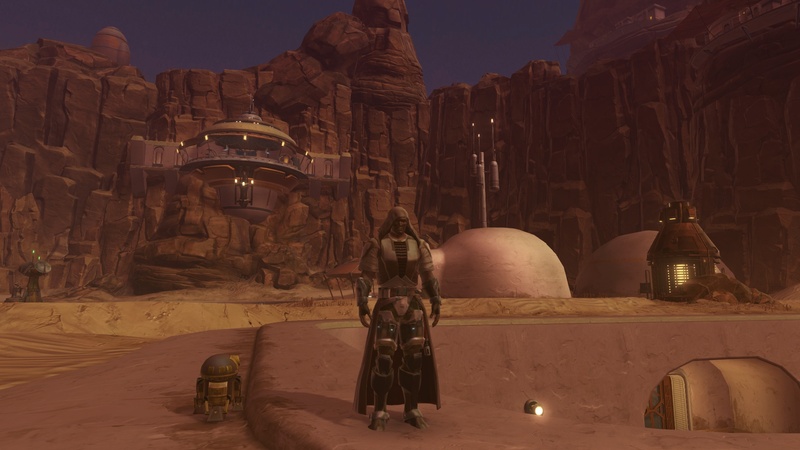 Especially since Agen Kolar canonically adopted bits of his heritage into his Jedi outfit with his Iridonian field boots. So Bren always wears footgear that looks like you could hike around in it for a while. 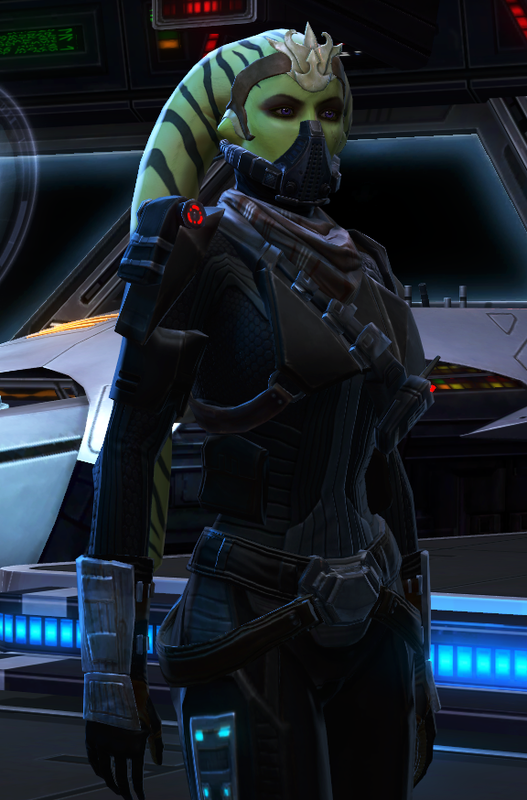 Missing from the screenshot is a simple headband with a small red dot on it that matches the leg-wrap-things. Colors are cream, grey, and light brown, with reddish-brown and yellow accents. Bren's a pretty typical Jedi aside from a few deviations. The yellow matches his saber and his droid! 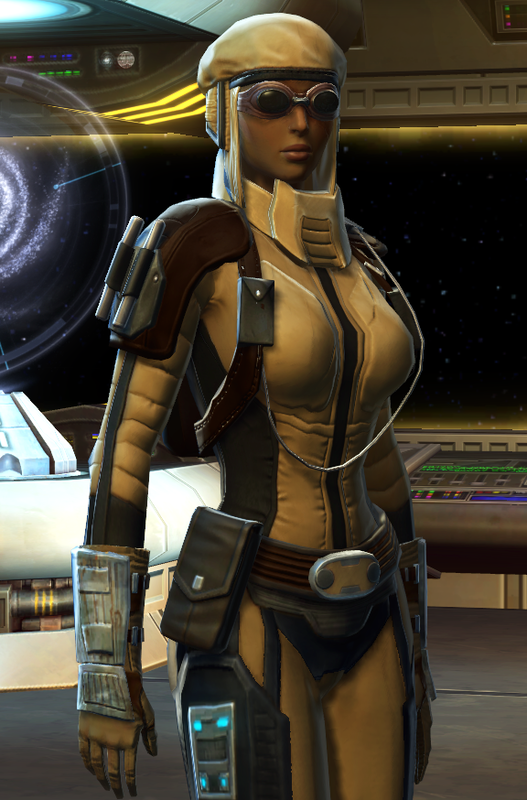 This is the more "typical" Jedi outfit, minus the nods to cultural heritage. 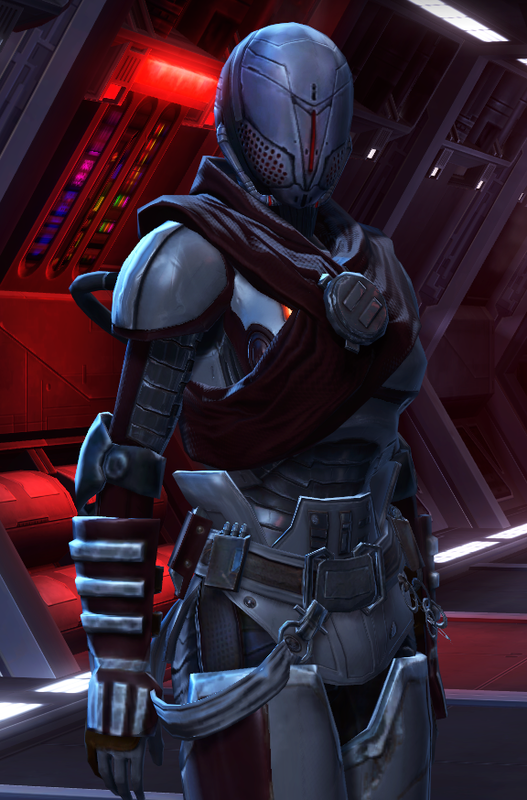 It keeps some of the look of the first outfit, like the bracers and the use of wrappings, but has a more typical robe look, more unified colors, and is armored. Sort of a "combat" outfit. 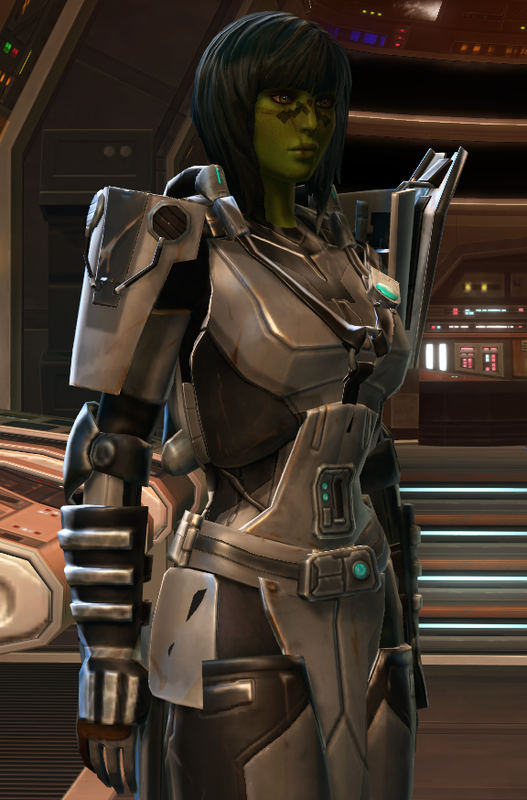 I imagine that the smooth parts on the front have some kind of protective value as well, synthweave mesh or something, plus the leg armor. Screenshot is missing another headband, but this one is more ornamented with beads and things. The overall oufit is simpler so he lets himself have a bit more of a flashy headband. I imagine this outfit can also stand up to weather and natural elements a bit better. Highlights here are blue, because the two elements I associate Bren with the most are water and earth. "Totally not a Jedi" outfit. More headcanons for Iridonian clothing, basically, but going for more of a mercenary look. Unfortunately, Bren's overall demeanor fools absolutely no one. Color cues are the same as above, with a bit more green, for the same reasons. 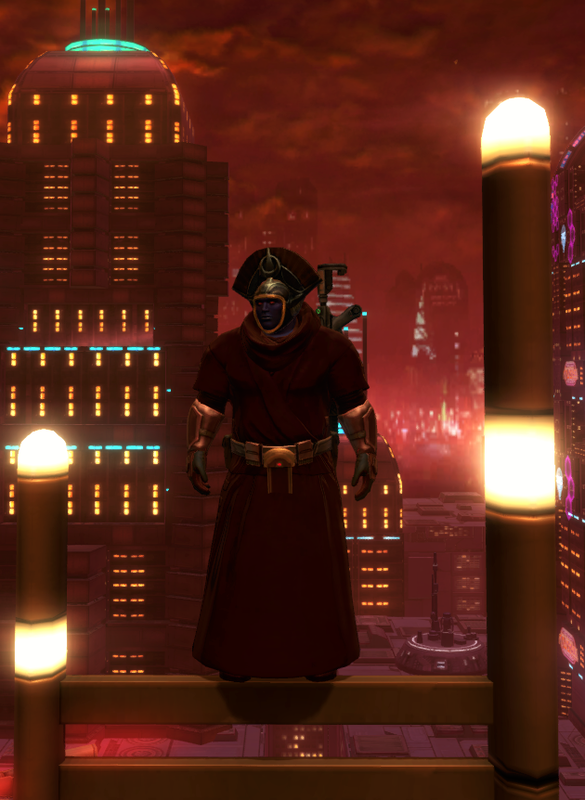 This was going to have some kind of headgear that was a head-wrap or helmet that obscured his face, but I never really got around to it and after KotET he'll bother with this outfit much less. This gets me thinking, rather than just post images of outfits, I should think about locale as well. I also need to post Seenine in her wedding skirt and Jessak's many outfits. 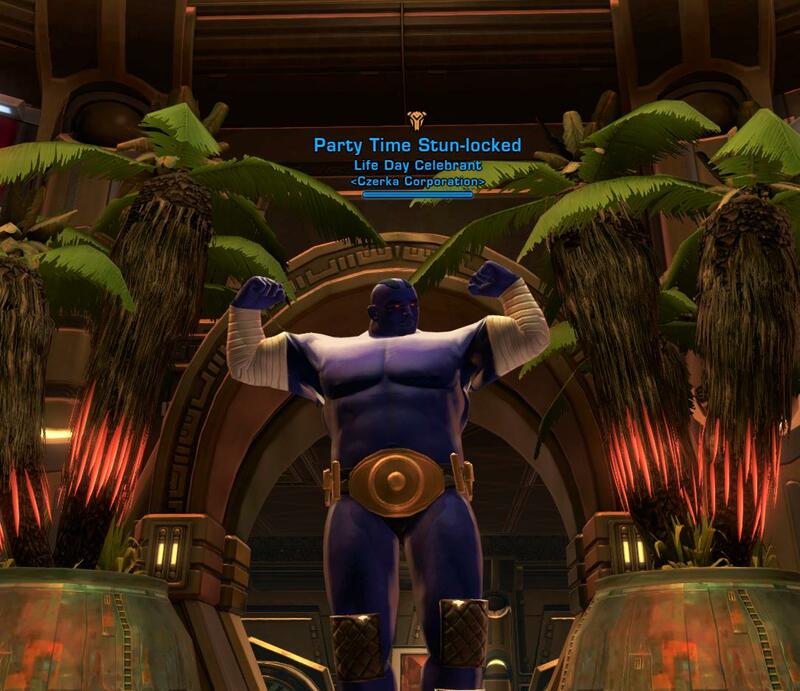 After thought: Stun should be wearing the relaxed jumpsuit or covert energy top, Jori Daragon's loincloth, the belt he's wearing, and lana beniko's boots. I was gonna make a joke about this hat looking like a mitre. But unfortunately it only comes in red, not papal. 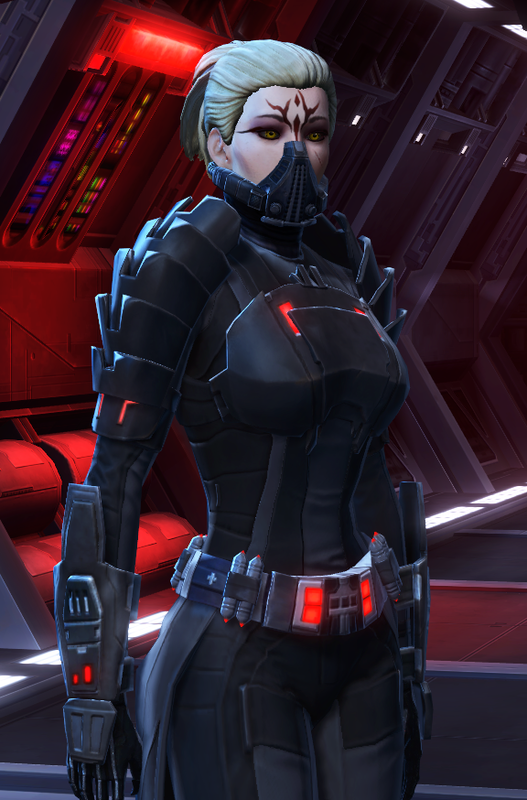 I'm not sure that my Sith really have anything creative outfit-wise and none of their armours really mean anything OOCly, but they still look damn good and that's what matters. 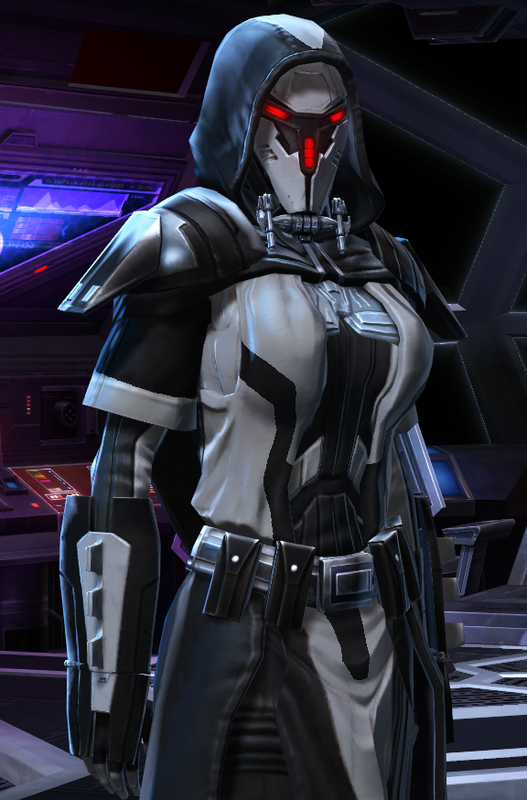 My favourite kind of gear is a really heavy outfit, whether it's an Imperial commando's powered exoskeleton or a Sith's armourweave robe. Not only is heavy armour totally hawt PRACTICAL IN CLOSE-QUARTERS SOCIALIZATION, you get to make stomping noises EMPLOY AUDITORY INTIMIDATION TECHNIQUES and crash through doors CREATE NEW TACTICAL OPPORTUNITIES all the time. 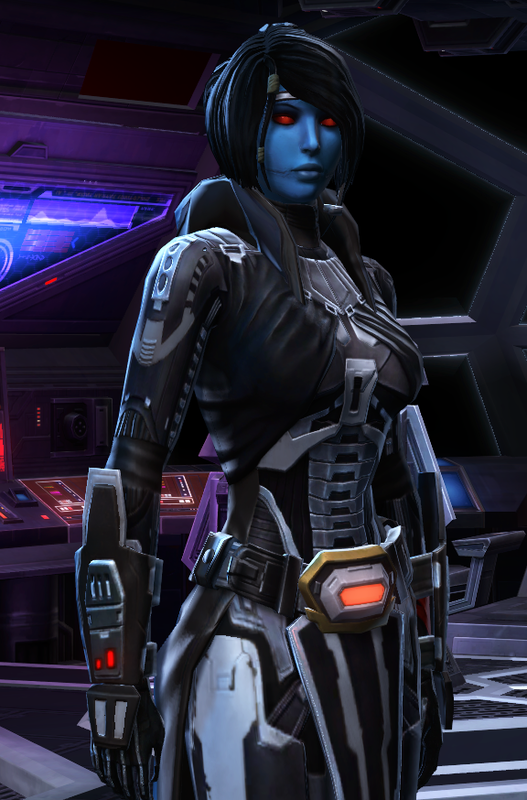 Imperials in general get all the best looking stuff as far as i'm concerned. 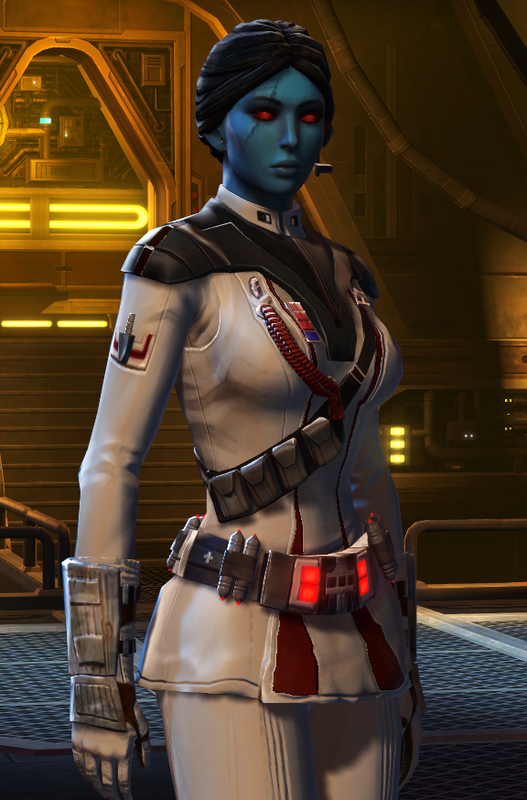 Their military dress uniforms are great and i'm pretty sure Bioware's design goal was make the Empire look as spiffy as possible in all situations. Form-fitting armour and long boots never looked so great! Actually they always did, but they still do so that's a win as far as i'm concerned. 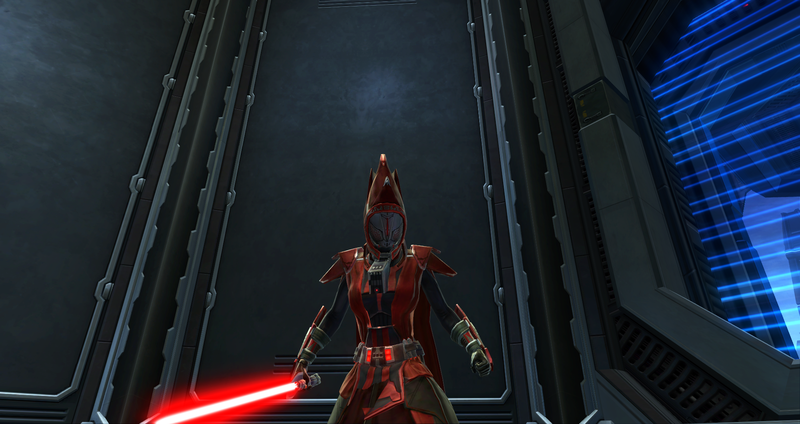 I am out of things to say so here's a picture of my Sith sorceress and Jedi shadow. What do you use for screenshots Squiggly? They look a helluva lot less compressed than mine. I use Steam with the "Save an uncompressed copy" option enabled under In-Game settings. It's great to know that's available; I've been using Fraps up til now. 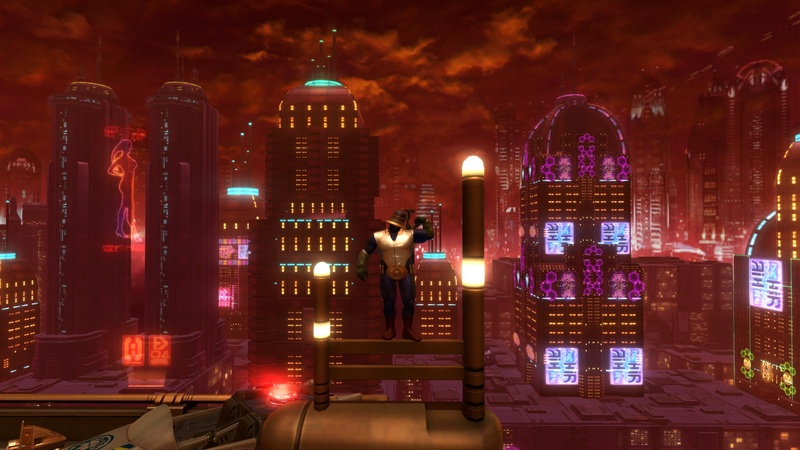 How do you use steam to take screenshots? 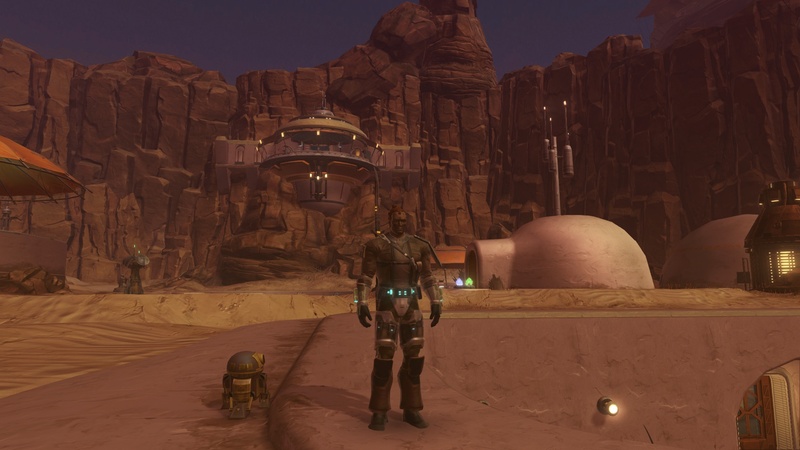 SWTOR won't let me take them in flashpoints or cutscenes. Also, you need the appropriate dyes now Seb. Either black and purple or orange and brown to complement stun's coloring. :P His loincloth is actually purple, but it seems to be blending in with his legs in the pic. 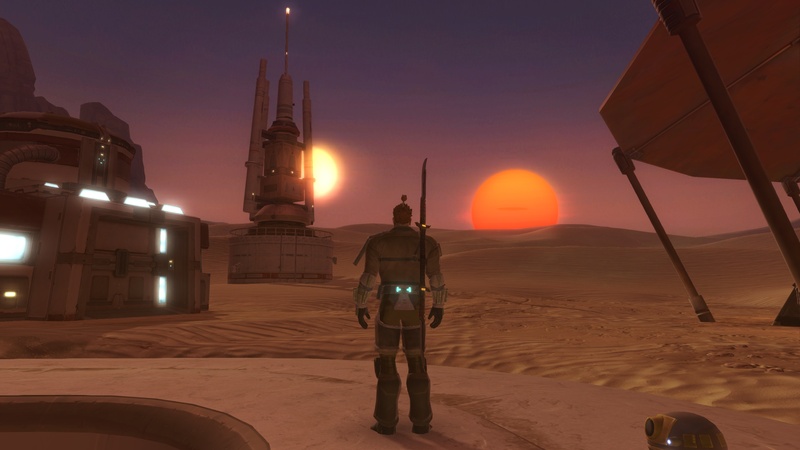 I think you have to run Steam as an administrator then add launcher.exe from your SWTOR directory as a non-Steam game. Though I remember it was a pain in the arse to figure out so I don't even know if that's right. 2. Click "Games" at the top, then "Add a non-Steam game to my library". Then, you should have Steam Overlay enabled. Default is "Shift+Tab" to bring it up in-game. Default screenshots are F12, I believe. 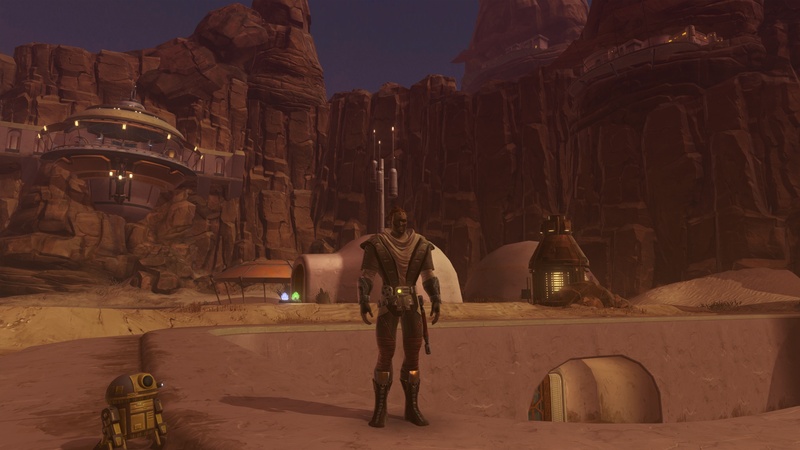 If Steam Overlay isn't working after opening up SWTOR as you normally do, instead, open it up from Steam. In your Games Library, it will be named "launcher". All credit goes to Squiggly for this.